mm105: Ask the Pilot Returns! He never left, really, his column appears in Salon every other Friday. But his appearance in this space in July had two interesting effects. 1. For two days, the post evinced the largest readership ever for L-HC, by a two or three times. 2. One of those readers turned out to be a Salon lawyer, taking MUDGE to task for reproducing the article in its entirety, a copyright violation. They get millions of hits a day — Patrick Smith’s article pushed L-HC into the stratosphere, so to speak, with two days of 90 hits. They had every right to be concerned. Anyway, it was Patrick’s topic, airline delays, that intrigued everyone, and he revisits that subject most brilliantly here. Tired of long delays? Look at the bright side of flying: It’s cheaper and more accessible than ever. Aug. 17, 2007 | As the airlines announce their highest-ever load factors (percentage of seats sold), 2007 clocks in as the most delay-plagued year in aviation history. The past few months in particular have been excruciating, with bottlenecks victimizing tens of millions of fliers. The problem has not gone unnoticed by the media, major and minor. It seems that every last reporter and pundit, at every outlet from the Christian Science Monitor to National Public Radio, has run a feature story on the country’s ever-worsening air traffic crisis. Up to now these stories have mostly been missing the point, failing to show that the real culprit here isn’t summer thunderstorms or faulty air traffic control equipment; it’s the airline industry’s obsession with pumping more and more airplanes — particularly smaller regional jets (RJs) — into an already saturated system. At long last, some of the coverage is getting it right. Namely, I refer you to Scott McCartney’s excellent report, “Small Jets, More Trips Worsen Airport Delays,” in the Aug. 13 edition of the Wall Street Journal. McCartney, author of the paper’s “Middle Seat” business travel column, examines the airlines’ untenable fixation with frequency. Even with a greater number of people flying than ever before, the size of the average aircraft has been shrinking. That means more takeoffs, more landings, more gridlock. The average jetliner now has 137 seats — 23 fewer than it did five years ago. The use of RJs, which carry anywhere from 35 to 70 passengers, has increased nearly 200 percent in that span. I’ve yet to read a better analysis on the subject, and I’m glad someone’s finally taking notice of the problems with regional jets — a topic I covered extensively back in June and mid-July. And you can’t entirely blame them. After all, we’re getting what we ask for. When airlines come around asking for opinions, their customers invariably answer yes, absolutely, they want and appreciate the opportunity to choose from no less than 35 daily departures between Los Angeles and San Francisco, Chicago and New York — even if only a quarter of those flights are anywhere close to departing on time. So, here’s the link to the article, per our Salon-induced process. Enjoy, and say “Hi!” to their advertisers, from MUDGE. The real cost of air travel — the price of a ticket adjusted for inflation — has fallen sharply over the past 20 years, even with tremendous surges in the cost of oil. According to the Air Transport Association, fares in 2006 averaged 12 percent lower than what they were in 2000, in spite of a 150 percent rise in jet fuel costs. Long after deregulation, fares have continued to drop as airlines have worked to squeeze cost from their product. Amenities and customer service aren’t what they used to be — on the whole they’re acceptable, and of late they’ve been improving — but what do you expect from carriers whose per-mile profit margins are sometimes a penny or less? Airlines sell what people claim to want. And if you read the surveys, even more than wanting lots and lots of flights to pick from, people want tickets at rock-bottom fares. Traveled to Boston a couple of weekends ago, for business, at an extraordinarily low fare (my employer never expressed the appropriate gratitude — short of paying for it of course!). Could control outbound, scheduled for the morning (always a better bet — accumulative delays have less time to accumulate in my experience), and still departed and arrived about 45 minutes later than scheduled, par for the course and not bad, all things considered. The return was the Wednesday evening the conference was completed; when the courtesy shuttle got us back to Logan, found some colleagues who had decided not to wait for the free bus and took the taxi due to bookings on earlier flights still glumly awaiting their aircraft — storms in the Midwest. Our flight was scheduled for much later, as it happened giving the weather at our destination an opportunity to clear, and again left and arrived about 45 minutes later than scheduled; for that hour of the night (a bit nerve-wracking when we realized that it was the last flight to O’Hare in the day’s schedule), not a bad outcome. And my extended stay at Logan yielded this interesting benefit. 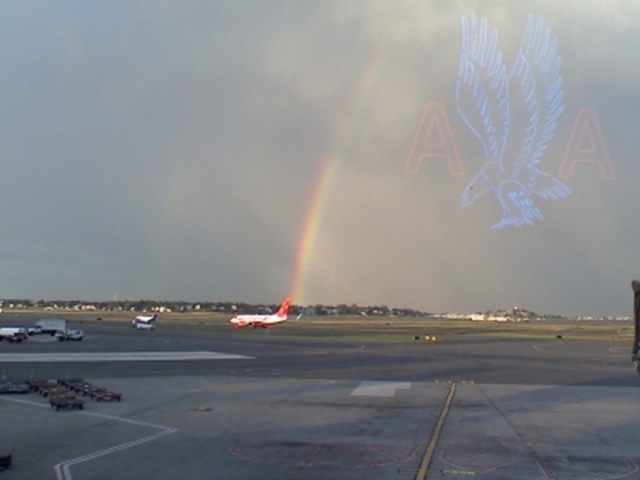 Yeah, a rainbow, absurdly bright; and those of us snapping it got an unusual benefit, the reflection of the retro American Airlines logo mounted high on the wall opposite the terminal’s window. Photographed and transmitted by the way, on my LG EN-V (yes, no longer does MUDGE have EN-V envy!). By the way, this reduced image hardly does the original justice. And another nice change to savor, the next time you’re turning lazy circles over a holding fix: The person next to you might be ugly, and he might not stop talking, but at least he isn’t smoking. This entry was posted on Saturday, August 18th, 2007 at 7:58 am and is filed under Blogging, musings, Travel. You can follow any responses to this entry through the RSS 2.0 feed. You can leave a response, or trackback from your own site. 8 Responses to mm105: Ask the Pilot Returns! I hate to fly. I like to take the train. I have to fly to the left coast now and then though. Last time I flew to LAX it took me 30 hours to get there. It was a hell trip! Glad your trip to bean town went well! I love Love LOVE trains; but save for an occasional commuter ride or two, and an excursion at the wonderful Illinois Railroad Museum, I don’t ride them. They just don’t go where I’m going. It is a long held dream to have the time and money to take the current reincarnation of the Empire Builder to Seattle, and then the Coast train from there to one of the centers of MUDGE’s universe, L.A. Nice dream. Sigh. So, we fly, happy enough to pay those dirt cheap prices; and settle for getting what we pay for. The *lawyers* were after you? Now that’s funny. Except I’m coming after you too. 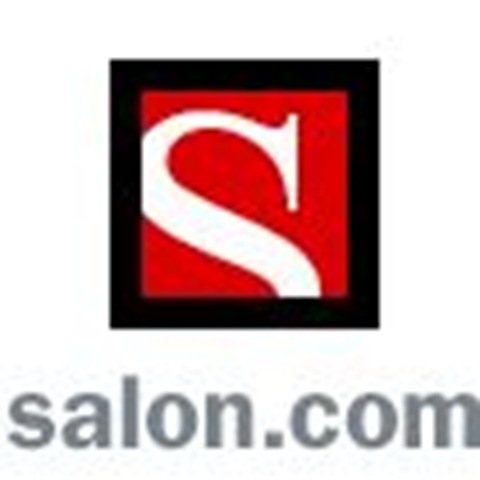 I want 90 cents — a penny for each of those hits you stole from Salon. Nice shot from Terminal B at our beloved BOS. Put it on my tab, please! Gotta say that I’m impressed you found me. Your beloved BOS too often reminds me of the late, lamented much tinier but equally waterbound general aviation airport in downtown Chicago, Meigs Field (“…splash!”). A little too much water, a little too close by. Anyway, I’m grateful that you stopped by. Most apprentices have a couple of simple questions regarding. Hey there! I realize this is somewhat off-topic but I had to ask. Does running a well-established blog like yours require a large amount of work? I am completely new to operating a blog but I do write in my diary on a daily basis. I’d like to start a blog so I can easily share my personal experience and thoughts online. Please let me know if you have any recommendations or tips for new aspiring bloggers. Appreciate it!